Join us on February 23rd for an African Style Cabaret Night with ISSAMBA. ISSAMBA promotes and brings together music from across African cultures to present a unified African groove. ISSAMBA’s artists travel from abroad, gracing your city with their special talents and aspects of their culture. 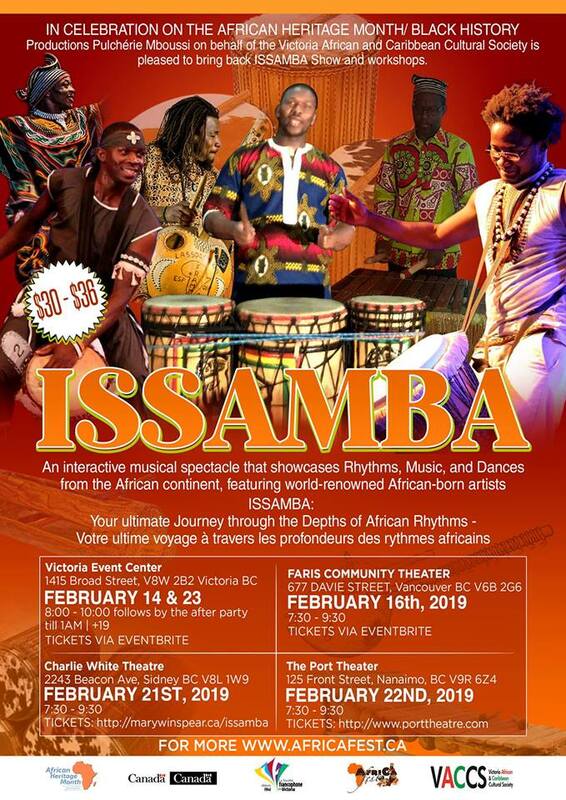 ISSAMBA, a 90 minute show that gives you a glimpse into the rich and diverse musical culture of Africa, an invaluable experience. The fusion of song, dance and music makes by ISSAMBA’s artists creates a robust and spectacular cultural alloy that nobody can resist! AFRICAN HERITAGE MONTH//Black History Month is significant to Black-Canadian history in many ways. This month honors the legacy of Canadians, past and present. The month is also important for providing communities with insight into the experiences of black Canadians. Our gratitude and respect to the W̱SÁNEĆ, Lekwungen, Songhees & Esquimalt people as we are mindful that this event will be taking place on unceded territories of these peoples.